"Don't Laugh at the Comics," was the title of the Family Circle magazine interview article with noted Harvard psychologist and inventor of the lie detector, William Moulton Marston that really started it all. Published in October of 1940 and penned by his former student Olive Byrne-- the article which championed the potential educational impact that comic books could have on children in a capacity more than just providing a vicarious escape from the Great Depression-- found a kindred spirit among the man who would go onto create DC Comics, Max Gaines. Soon after, Gaines employed Marston to become the printer's "educational consultant," and shortly following his arrival, Marston-- inspired by both Byrne and his wife Elizabeth, decided that the world needed a brand new superhero. And in coming up with one, his mission was to counteract the hyper masculine counterparts of DC typified by Superman, Batman, and the Green Lantern (soon to star in the next Warner Premiere DVD) so the polygraph creator said that he wanted to invent a character "who would triumph not with fists or firepower, but with love." His wife's reply-- according to Boston University's Fall 2001 alumni magazine was a simple "fine," added with a society altering request when she said, "but make her a woman." And the rest, as they say is Amazon history. For as soon as she made her debut in DC's All Star Comics #8 in December of 1941 (and ironically in sync with the beginning of our involvement in World War II when women found themselves in the workforce), the beautiful, headstrong heroinebecame not only the first female superhero in the history of American comics but one that's still beloved to this day. "Not even girls want to be girls so long as our feminine archetype lacks force, strength, and power. Not wanting to be girls, they don't want to be tender, submissive, peace-loving as good women are. Women's strong qualities have become despised because of their weakness. The obvious remedy is to create a feminine character with all the strength of Superman plus all the allure of a good and beautiful woman." However, and while proportionally in ratio of men to women while DC Comics was always more prone to be "more progressive for women," as is revealed in the first disc's extra Wonder Woman: The Amazon Princess, as Disc 2's in-depth documentary Wonder Woman: A Subversive Dream reveals, censors and conservatives tried to crush what they felt was her overt sexuality and sensuality creating a Comics Code Authority that had to approve everything which the interviewees felt may have exacerbated Marston's polio. And indeed, he was so much a part of Wonder Woman that following his death, DC Comics was uncertain whether or not the character could continue but its popularity flourished as Wonder Woman survived its many incarnations as a sexier Avengers styled contemporary woman in the '60s to becoming the cover of Gloria Steinem's debut issue of Ms. with the tag-line of "Wonder Woman for President" up through its television series with Linda Carter and animated appearances in Warner Brothers and DC Comics' The Justice League. And so it's only fitting that she's now the star of her very own feature length film. 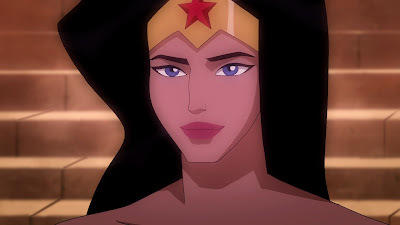 Additionally, since Hollywood just can't seem to get it together in the creation of a live action version of Wonder Woman after the duds of Catwoman and Elektra and recent rumors of Joss Whedon's version (allegedly to have starred his Buffy and Dollhouse heroine Eliza Dushku) now fallen through the cracks-- I'm delighted to report that this stellar quality animated version featuring Oscar nominated vocal talents and stunning artistic quality not only surpasses WB's pre-Dark Knight anime work Batman: Gotham Knight and Lionsgate's Marvel offering Hulk Vs. but is a work that honestly could've played theatrically on its own. Reuniting Waitress cast members Keri Russell and Nathan Fillion, the film takes a beneficial "origins" approach to its character with a mesmerizing (and surprisingly violent) near-prologue which sets the stage of the battle against the war god Ares (Alfred Molina) by Queen Hippolyta (voiced by Sideways star Virgina Madsen) and her fellow powerful "sisters" including Artemis (Rosario Dawson), Persephone (Vicki Lewis), and Alexa (Tara Strong) for their emancipation following years of slavery. When Zeus and Hera prevent Hippolyta from killing their son Ares, they opt instead to make him their prisoner and give the women the utopian peaceful island of Themyscira-- a mystical civilization where the Amazon sisterhood can live in beauty and harmony away from the evil of the outside male-dominated, violent world. Once there and unable to bear children, Hippolyta is able to create a daughter out of love and clay with the help from the Gods and she grows into the over-sheltered Princess Diana (Keri Russell) who-- tired of never getting more heroic opportunities and dangerous assignments like Artemis-- decides once and for all to prove her mother wrong. When American Air Force fighter pilot Steve Trevor (Fillion) crash lands in Themyscira, Hippolyta decides that a competition will be held to determine which of the Amazon sisters should serve as the most capable emissary to return him back to the outside world of America, Diana dons a helmet as a disguise and accepts the gladiator challenge which, naturally she wins. Bestowed with the indestructible bracelets and American flag modeled uniform to show respect for the United States, she and Steve journey to New York City where within minutes-- Diana instills girl power in a young child left out of playing with boys and chides a flirtatious office worker for going into the damsel in distress routine to try and attract men. Feminist and proud, the gamely Diana quickly proves that she isn't susceptible to Steve's attempt to get her drunk on tequila (which he refers to as his version of the Lasso of Truth) or willing to back down from muggers as she routinely saves the lad in distress instead of the other way around. And while the animators and screenwriter Michael Jelenic thankfully and rather humorously give her a purple dress to conceal her skimpy Betty Grable style pin-up attire so that he won't be picked "up for solicitation" by acknowledging the rather revealing outfit-- luckily that's as far as they go in modernizing the comic or the woman. No, throughout the seventy-four minute animated work directed by Lauren Montgomery, who is also working on the upcoming Green Lantern:First Flight, following her direction of 2007's Superman: Doomsday and work as a storyboard artist on Justice League and the recent Hulk Vs., Wonder Woman remains incredibly faithful to the original comic-- so much so that it's an equal treasure for ardent enthusiasts of the superhero as well as those just casually checking it out. Additionally, with its superlative quality as again the best straight-to-disc animated superhero work I've seen over the past year with crisp animation that came alive when the DVD was up-converted in my Blu-ray player filling the widescreen television-- it ends on a note that helps establish the Wonder Woman Diana was to become in a way that makes it possible for more films to follow. While of course, one worries about a studio cashing in too much on a successful and creatively sensational product but if the same team is employed and the same care is taken that's evident in both the finished work as well as all of the heavily researched documentaries that make the two-disc version far superior (complete with a Digital Download for Windows Media PC compatible devices), then I'd say long live Wonder Woman and moreover, why why not involve them in a live-action version if it ever gets off the ground.